Historical Aragatsotn is rich of valuable monuments. One of them is the church of St. Hovanes in the village of Mastara. It stands out among central-domed cruciform (inside and outside) churches, like the big church in Artik, the church of St. Gregory of Arichian cloister, St. Sarkis in Voskepar and Arakelots in Kars (X c). Another version of this type is the temple in Bagaran (first half of VII c), in which unlike the temple in Mastara and like Echmiadzin's temple, four pylons carrying the dome are added to the central praying hall, on account of which a completely different constructive system of the passage to the dome is formed. In one of five epigraphic inscriptions at Mastara temple, Gregory Vanakan is mentioned as a builder , another one records the repair of the church in 891. Many points of view exist about the dating of the temple (V-VI, VI- VII cc). Some consider if to be built in VII c with the preserved remainders of still existing more ancient church. For various reasons the last version is considered more probable. The composition of the scheme of the church in Mastara is close with the scheme of Echmiadzin cathedral. It is cruciform inside and outside. The sides of the cross make half-rounded apses, which except the eastern one (with two side-chapels), advance as five-bordered volumes of facades. The main difference of the schemes of Echmiadzin's cathedral and the temple is the absence of four pylons in the praying hall. Thank to this, as in churches like dome halls, the praying hall isn't divided and is taken as a single inward volume. In Bagaran temple there are four pylons, the drum of the dome and the dome itself turned out to be more precise volumes, which associate with its general volume-spatial composition. 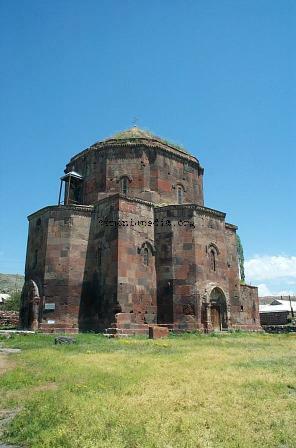 The art-architectural means used in the temple of Mastara correspond to the old Armenian architectural style. Such appear to be portions in southern and western facades, somewhat distorted by the reconstruction, the window edges of facades and of the dome (the western window also had a peculiar framing), the closing walls and the drum, archlike cornices. Still, these architectural means don't define the general, rather simply solved look of the temple. Its main merit is the interior, and of course the mighty monolithic outward volume. The Temple in Mastara is evidence that the builders of ancient Armenia unflinchingly looked for and found new versions of central-domed, cruciform churches with constructive solutions corresponding to them. Thank to these qualities the temple in Mastara has a worthy place In the architecture of Armenia of early medieval times, appearing to be one of its best works. The village Mastara is rich of other archeological and architectural monuments. Among them especially notable is a large free-standing khachkar on a rock covered thinly like a canvas with decorations. This page was last edited on 16 October 2010, at 01:26.